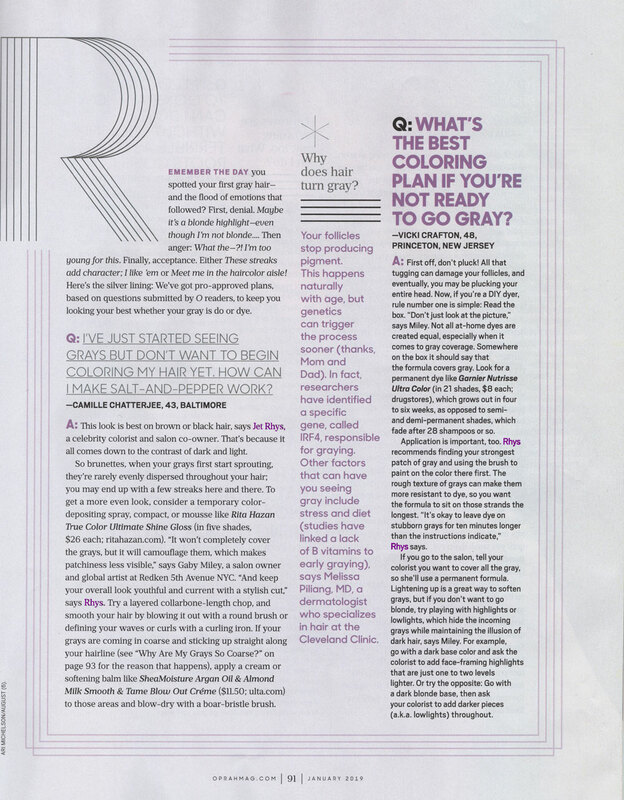 Q: I’ve just started seeing grays but done’t want to begin coloring my hair yet. How can I make salt-and-pepper work? A: This look is best on brown or black hair, says Jet Rhys, a celebrity colorist and salon co-owner. That’s because it all comes down to the contrast of dark and light. So brunettes, when your grays first start sprouting, they’re rarely evenly dispersed throughout your hair; you may sendup with a few streaks here and there. To get a more even look, consider a temporary color-depositing spray, compact, or mousse. 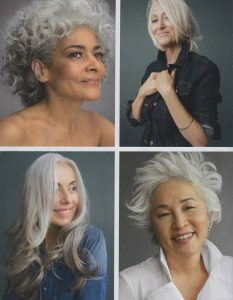 “It won’t completely cover the grays but it will camouflage them, which makes pithiness less visible” says Gaby Miley, a salon owner and global artist at Redken 5th Avenue NYC. “And keep your overall look youthful and current with a. Stylist cut,” says Rhys. Try a layered collarbone-length chop, and smooth your hair by blowing it out with a round brush or defining your waves or curls with a curling iron. 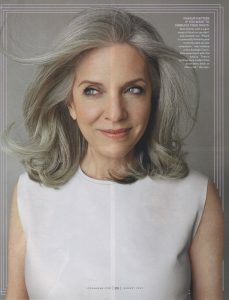 If your grays are coming in coarse and sticking up straight along your hairline apply a cream or softening balm to those areas and blow dry with a boar-bristle brush. Q: What can be done to keep grays away between dye jobs? A: Maddeningly, grays can start showing as soon as a couple weeks after coloring! If you (or your colorist) are already using permanent dye, you have a few options. The highlights/lowlight tricks mentioned earlier will help extend your color. If you dye at home, try a root touch-up kit between color sessions. Or mix up the formula you normally use and apply it to your roots only. Here’s the technique Rhys suggests: Divide your hair into four sections by parting it down the center from forehead to nape and then again from ear to ear. Starting with one of the back quadrants, take horizontal sections of hair and paint the color on only the new growth from the nape to the crown. Repeat with the other back section. Now move to the top of your head. Starting from just above the ear, take horizontal sections and paint color on your roots until you reach your center part. Repeat on your other side. Then cover the top of the bottle with plastic wrap, put the lid on it, and store it in your bathroom vanity until you need it again, Rhys advises. If you have a special event coming up and no time to DIY, ask your salon whether it offers express color: “Just the part, the crown and around the face,” she says. “It’s usually half the price or less.” Otherwise, try a temporary fix. Tinted powders with hair-binding technology (meaning they stick to your strands) tend to work better than pencils and mascara-wand-like products, which can have less staying power. Unlike the touch-up kits mentioned above, these powders last only until you wash them out. One we like: Bumble and Bumble Hair Powder in Blondish and Brownish. My brows are becoming gray, too. What can I do? This is one case where you don’t want to match your brows to your hair–you’ll look too washed-out. Instead, keep them your normal color, says colorist Jet Rhys. Ask for an in-salon tint, or try makeup (a very temporary fix): Brush on a tinted brow mousse or tinted gel with a spoolie (like a mascara wand). One to two shades brighter than your haircolor is most flattering. 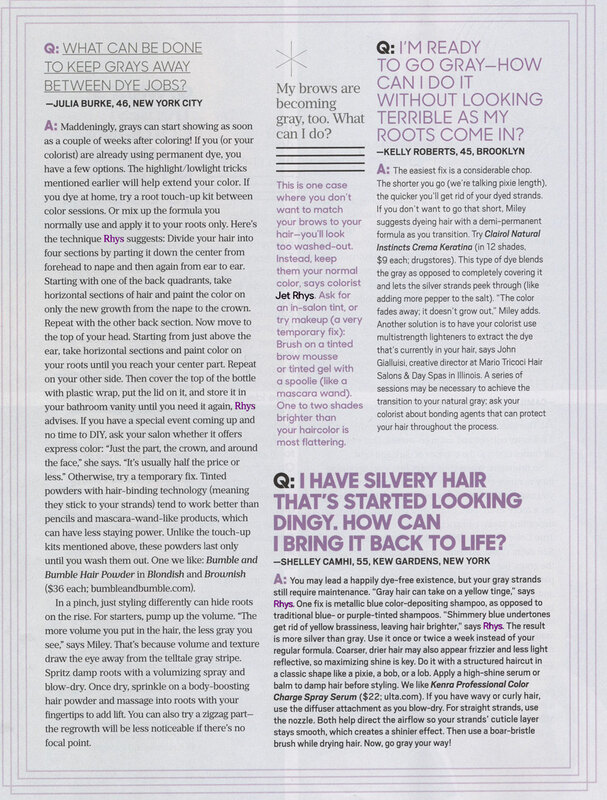 Q: I have silvery hair that’s started looking dingy. How can I bring it back to life? 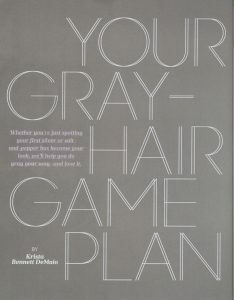 A: You may lead a happily dye-free existence, but your gray strands still require maintenance. “Gray hair can take on a yellow tinge,” says Rhys. One fix is metallic blue color-depositing shampoo, as opposed to traditional blue- or purple-tinted shampoos. “Shimmery blue undertones get rid of yellow brassiness, leaving hair brighter,” says Rhys. The result is more silver than gray. Use it once or twice a week instead of your regular formula. Coarser, drier hair may also appear frizzier and less light reflective, so maximizing shine is key. Do ti with a structured haircut in a classic shape like a pixie, a bob, or a lob. Apply a high-shine serum or balm to damp hair before styling. If you have wavy or curly hair, use the diffuser attachment as you blow dry. For straight strands, use the nozzle. Both help direct the airflow so your strands’ cuticle layer stays smooth, which creates a shinier effect. Then use a boar-bristle brush while drying hair. 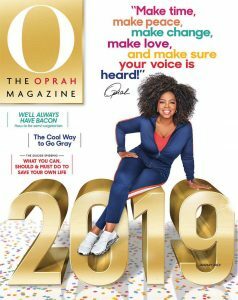 Now, go gray your way! Short Styles | Can You Pull Off The Bowl?